RAQA (SYRIA) - "Don't close your eyes. Stay awake!" the anti-jihadist Syrian fighter yelled at his injured comrade as a Humvee whisked them across the Islamic State group's former stronghold Raqa. 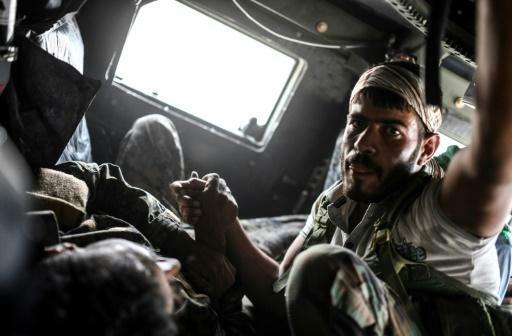 With the battle drawing closer to the city centre, the distance to the nearest medical facilities is lengthening, making its increasingly difficult to keep injured fighters and civilians alive. The military vehicle carrying the wounded Syrian Democratic Forces (SDF) fighter whipped around a pile of rubble in Raqa's battered northeast as the man bled heavily from a gunshot wound in his ribs. His lolling head was supported by his comrade throughout the bumpy 20-minute ride along destroyed streets to the nearest stabilisation point, in the eastern Al-Meshleb district. A team of medics there rushed to stop the bleeding, stitch the wound, and quickly pack the fighter into an ambulance headed north. Ahead of him was a journey of at least two hours through desolate terrain to the nearest proper hospital, in the city of Tal Abyad on the border with Turkey. The fighter's survival would depend on the initial treatment received during what medics call "the golden hour", said Farhad Delli, a nurse with the Kurdish Red Crescent. "Those wounded with a gunshot or blast wound from a mine are bleeding heavily. Medics should stop the bleeding before they arrive," said Delli, who provides urgent care at a stabilisation point in Hawi al-Hawa, on Raqa's western edges. Hundreds of civilians have been killed and many more wounded since the US-backed Kurdish and Arab fighters of the SDF broke into Raqa city in June. The Kurdish Red Crescent has established various stabilisation points around the city to respond, and treats between 80 to 100 people a day, Delli said. Of those, around a dozen with severe injuries are transferred each day to hospitals further north for life-saving operations. But the task of keeping people alive long enough for them to reach proper hospitals has become increasingly difficult. In the early phases of the Raqa battle in June, the journey from the front lines on the city edge to the Tal Abyad hospital took 90 minutes. As battlefronts have drawn deep into the heart of Raqa, and checkpoints along poorly maintained roads have multiplied, the trip has doubled in length, said Vanessa Craymond, medical coordinator for Doctors Without Borders (MSF), which supports the Tal Abyad hospital. "That long travel time means patients are often arriving in far from a good state. It takes us extra time to get them ready to go to theatre (surgery) -- if they make it to theatre," she said. "If it was safer to have a hospital where surgery can happen closer to the front line, that's a chance to treat those people and get a better chance of survival in those situations." There is also no cellphone service on the road out of Raqa, so Red Crescent medics provide as much information as possible to their counterparts in the hospital before they set out. "We write everything down on a card and send a picture of the patient to the Tal Abyad hospital to explain his condition," said Delli. "That way, when he arrives, they're prepared to treat him." Craymond says those messages are vital. "Every minute counts in trauma care," she told AFP outside the Tal Abyad emergency room, where a nurse examined a young child with a bandaged foot. "We're able to exchange photos of the injuries to give some advice and prepare ourselves on this end so we know how many patients are coming, how we will respond, who's going to (surgery) first," Craymond said. War wounded from Raqa make up the majority of patients in the sparsely equipped Tal Abyad hospital. Patients, relatives and doctors zigzagged across the chaotic waiting area outside the emergency room, as children's cries echoed through the corridors. Labels hand-written in red marker identified various beds in an urgent care ward, where four middle-aged men were being treated for blast wounds to their legs and arms. In an air-conditioned room nearby, a young girl with severe burns to the face tossed and turned. Just a few pockets of jihadist-held territory remain in Raqa, but the hospital staff are bracing for a new influx of wounded because IS is believed to be holding civilians as human shields. "The way the conflict is evolving at this point, there are more at-risk civilians," Craymond said. "We want to be ready to support the civilian response." For the SDF fighter with the rib wounds, the efforts were in vain. His comrades reported the following day that medics had been unable to save his life. "Don't close your eyes. Stay awake!" the anti-jihadist Syrian fighter yelled at his injured comrade as a Humvee whisked them across the Islamic State group's former stronghold Raqa.